There are so many trailer accessories and camping setups out there that it can quickly get confusing, especially if you are just considering a teardrop/travel trailer for the first time. What is really essential? 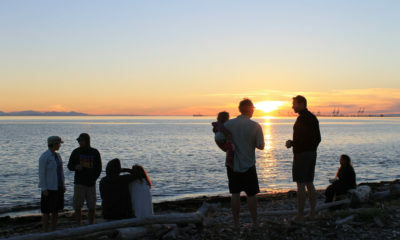 What will ultimately bring you the happiness, the peace of mind, and the flexibility you truly seek? At DROPLET, we believe in the power of versatility, without requiring a thousand extra accessories. That’s why our DROPLET already comes pre-equipped with basic comfort accessories such as LED touch lights inside and outside (kitchen area), a furnished kitchen area, lateral window vents, and a super large roof vent to keep a healthy airflow inside. For those desiring a bit more comfort and independence, here is our top 5 travel trailer accessories recommendations. Because traveling should remain more important than gear, after all. A 100W flexible solar panel comes as part of the “DROPLET Off the Grid package“. 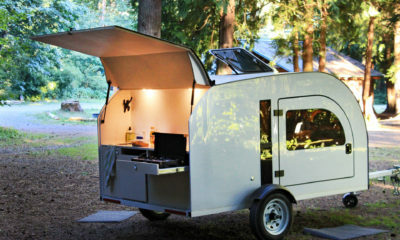 Probably our favorite trailer camping accessory since the invention of anti bugs spray. Why did we opt for a 100W/h flexible standing solar panel, rather than a semi-permanent roof option? Well, you only get as much as energy with a solar panel as you are able to capture. While we initially thought that a semi-permanent roof option would look better on the DROPLET, the efficiency of a solar panel is far higher when you can orient it directly at the sun. 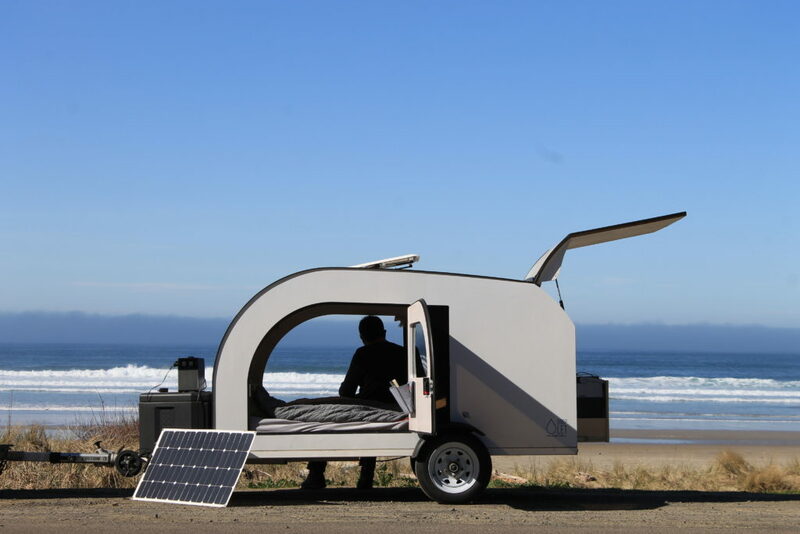 Would you rather move the trailer around all day to catch the sun, or move a lightweight sheet directly in the angle of the sun? Efficiency matters when you’re off the grid. If a Solar panel option is of interest to you, consider our ‘off-the-grid’ ready Droplet where the solar panel comes with it. 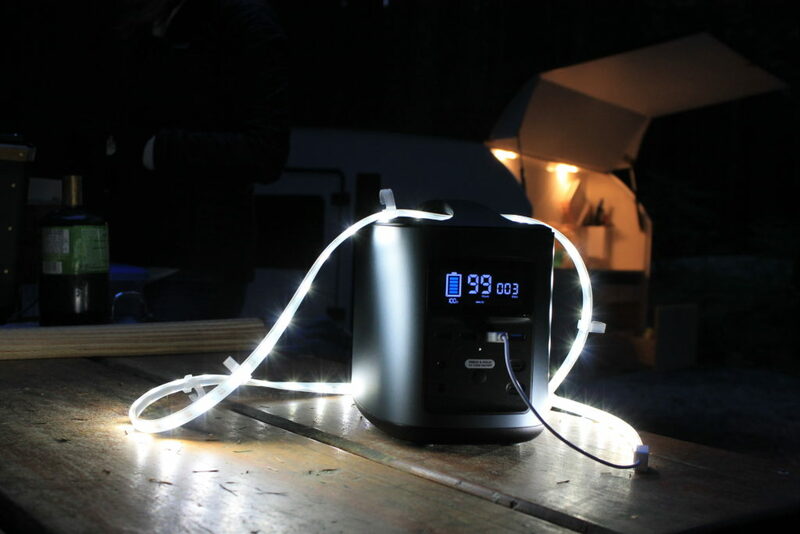 An amazingly portable power unit delivering 440W/h, with 2x 110V outlets, multiple USB plugs and 12V plugs. 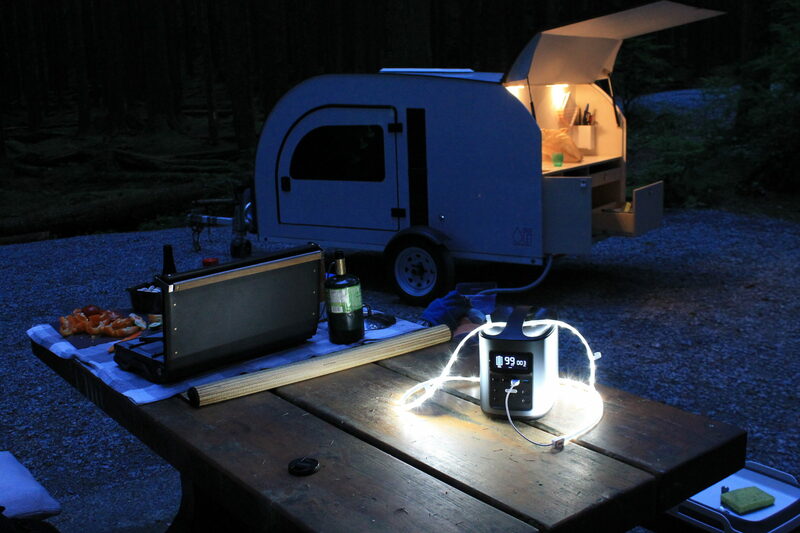 Freshly arrived in North America, ECOFLOWTECH RIVER is THE Ideal lightweight replacement for a generator to recharge your laptop, camera, drone, sound system, lights at the campground, etc. With up to 6-9x laptop charges and the option to charge it with your car as you drive or with a solar panel, there’s no shortage of power to be had on the go. In fact, we love the ECOFLOWTECH River so much that we chose to incorporate it for you as part of our ‘Off-the-grid’ ready Droplet. The Porta-Potty Dometic 972 will take care of your private business for a few days. 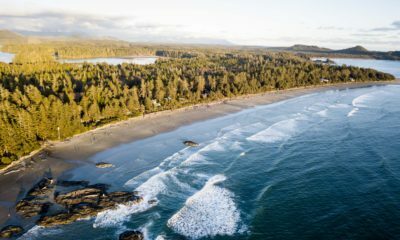 While we are lucky in Canada that almost every single campsite comes with great washroom facilities (or outhouses at the minimum), this can quickly become an issue if you are traveling across a remote area with no facilities. 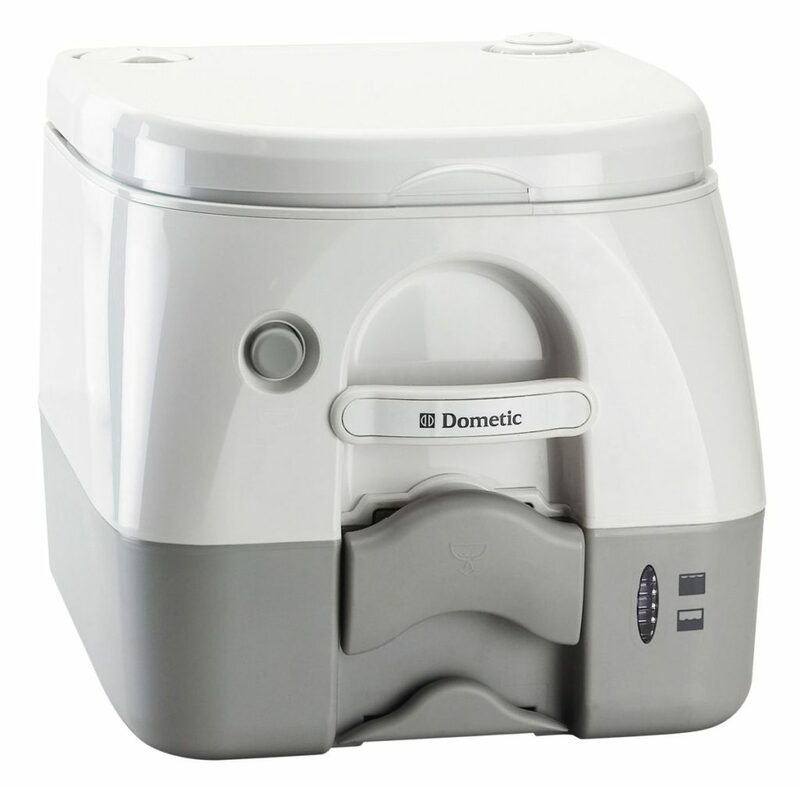 For those seeking their own portable washroom, we encourage you to respect Nature by not leaving any unwanted waste behind, and opt for a clean, light, self-contained option such as the Dometic 972. 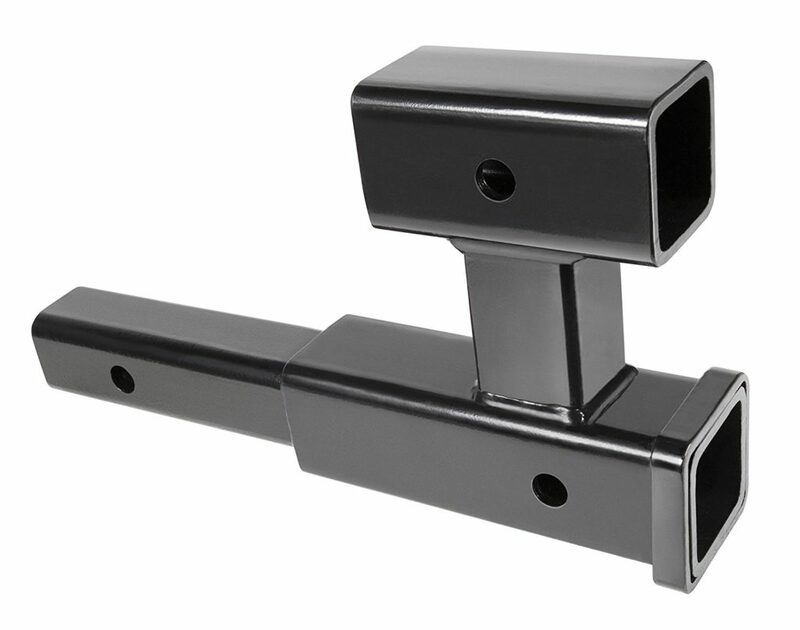 A dual hitch receiver adds versatility to your mounted car hitch at little cost. Ask your car dealer for more info. 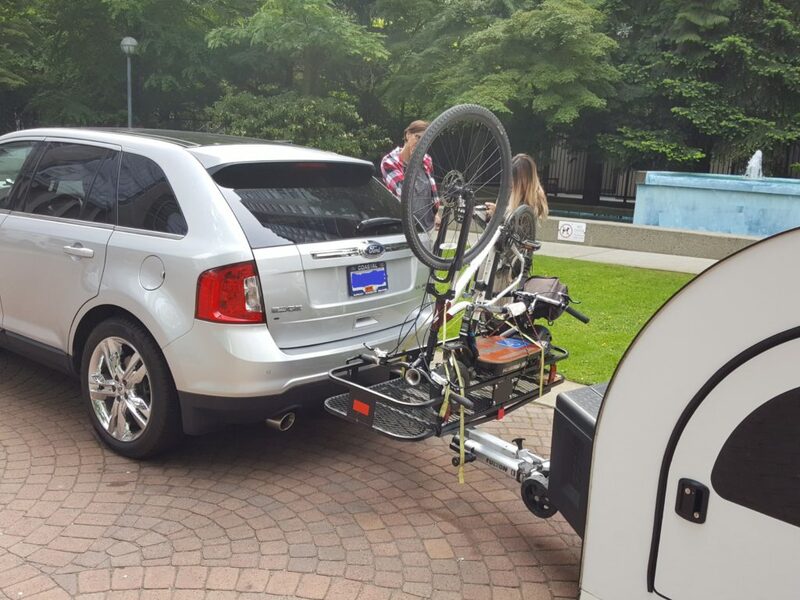 A Dual hitch receiver is an essential item for those desiring to add a bike rack, a basket carrier, or any other mounted accessories in the back of their car, while also towing a teardrop trailer like DROPLET. Dual hitch receivers come with two outputs of 2″, which can be used conveniently to add a charge behind the vehicle while still coupling the trailer. There are multiple options out there, some hitches even come with two or three receivers already integrated. A rear mounted basket carrier, attached to a dual-hitch receiver (see above). The primary hitch receiver remains attached to DROPLET. A rear mounted basket carrier is a nice option for those traveling with various gear, bicycles, e-scooters and other voluminous sport gear that do not fit into the trunk or inside the trailer. While it may fit a few less bikes than a designated rear-mounted bike rack, it remains more aerodynamic and versatile than a roof mounted rack, and thus will cost you less in gas over time. For your safety, we recommend NOT to overload the inside of the trailer while you drive, as heavy items could bounce around and cause serious damage to your trailer and compromise your overall safety. Instead, load the basket carrier and keep your trailer light for an optimized road behavior. We initially considered adding an optional roof rack to the top of DROPLET, but we came to the realization that very few campsites are located directly next to the riding trails. Practically speaking, keeping the bikes/boats/gear attached to the vehicle while leaving the trailer at the campsite made more sense to us. Did we miss anything? Leave a comment below or contact us here! How does the Ecoflowtech River compare with the equipment that’ll be supplied with our Droplet? * 300W built-in inverter with 110V and 5V usb outlets. * 12V Lithium portable battery 440Wh.